I hope you are all well! Sorry for the lack of posts but life has got in the way, I literally can't believe how close Christmas is now! Have you done all your christmas shopping? I still have quite a bit to do eek. I spent the weekend with my best friend who came up from Sussex and it was so nice to have a girly weekend. We have the kind of friendship where we don't have to do anything crazy like sky diving we just enjoy doing every day stuff and being in each others company. We went to our usual hang out, wagamamas, then to this amazing dessert place in Shepherd's bush called Ca'puccino their chocolate torte is amazing! If you haven't been I seriously recommend it. Finally we finished off the evening watching a Rugrats movie, who doesn't love the Rugrats right?! You are never too old for Rugrats and on Saturday we went to see Hannah's gorgeous twin sisters who were 6 months old this weekend! 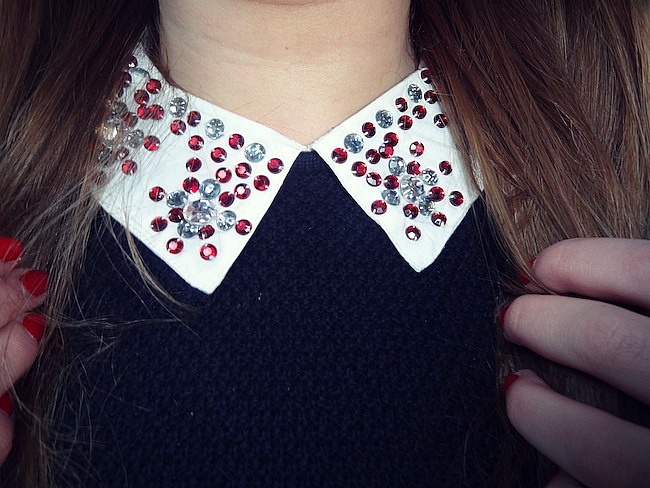 For the occasion I put on another new piece, this peter pan collar jumper from Asos. I was feeling spontaneous and ordered this one day and people who know me know this is major as I hate ordering online, but I am so pleased with it! It is the perfect fit and surprisingly warm it does say on the website that the jumper is black but I would say it is navy. I kept it casual with my trusty converse and I also had my barbour on so was channeling my inner preppyness! I have a Christmas work party lunch today which I am really looking forward too, hopefully I don't do the gangnam style dance, thankfully there is no videos of that! Have you got any Christmas parties coming up? Luckily I have all of my christmas presents already. The first time I bought them earlier :). 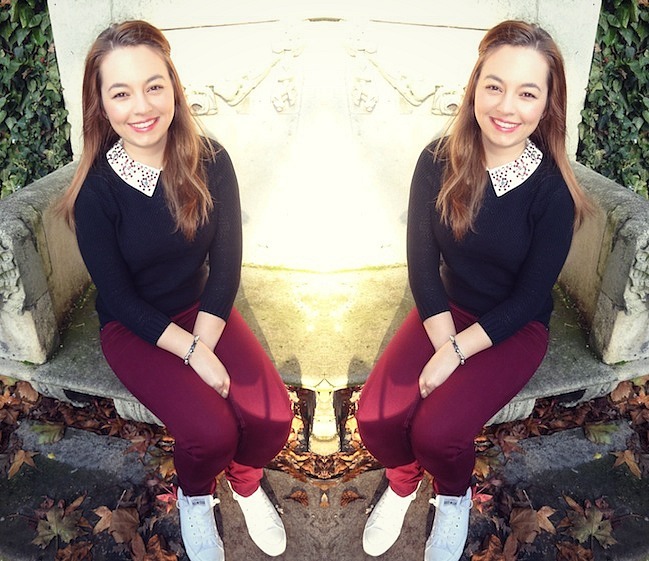 I love burgundy pants at the moment, wore one today as well! Have fun at your christmas party lunch! 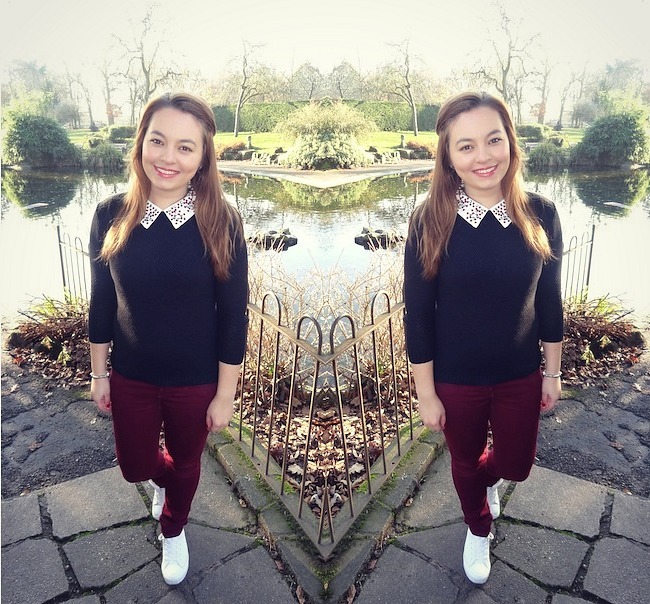 You look gorgeous as usual, the jumper is gorgeous and your hair always sits so perfectly!